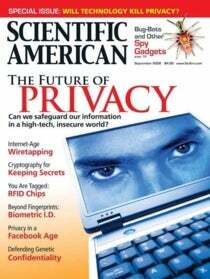 Introduction to SciAm's issue on Privacy. Our jittery state since 9/11, coupled with the Internet revolution, is shifting the boundaries between public interest and "the right to be let alone"
A cold wind is blowing across the landscape of privacy. The twin imperatives of technological advancement and coun­terterrorism have led to dramatic and possibly irreversible changes in what people can expect to remain of private life. Nearly 10 years ago Scott McNealy of Sun Microsystems famously pronounced the death of privacy. “Get over it,” he said. Some people, primarily those younger than about 25, claim to have done just that, embracing its antithesis, total public disclosure. And of course in many cases—determining the whereabouts of a terrorist or the carrier of a disease—public interest has an overwhelming claim on information that is usually private.